I'm looking at this one of two ways: that Pat Robertson sincerely believes what he is saying here. Either that, or as I have heard it said a number of times in my life: "Whom God would destroy, He first makes mad." During a broadcast of his 700 Club this week, Christian Broadcasting Network founder and "evangelist" Pat Robertson said that it was perfectly justifiable to divorce a spouse with Alzheimer's disease, on the basis that the illness is "a kind of death". In all honesty, I can't see how Pat Robertson - if this is his genuine belief - is any different from those who support abortion and the "right to choose". You know: the things that his Christian Coalition was alleged to be standing against for all those years? Yeah, how is this different from aborting a child? The rationale that Robertsin is offering is the same as that for killing an unborn within the womb: that it is a life too "inconvenient" for those who would rather live life to their own ends. ...and Pat Robertson says that if the other spouse cannot take it, then he or she is free to abandon his or her husband and wife and go after another?! Whatever the hell it is that Robertson is espousing, it is NOT a love that is scriptural or suggested at all in the Bible. Love between a husband and wife is something meant to be patient, kind, and longsuffering. If a spouse falls victim to Alzheimer's or any other illness, the other spouse will never abandon and leave them. That is, if there was truly any real love at all. To say this sort of thing is beyond the pale. 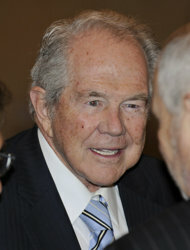 I have been saying for years that if Pat Robertson was serious about making the Bible the pattern to follow in this land, then he should have long ago been taken outside the Virginia Beach city limits and stoned to death for all of his nutty false prophecies (made in the name of God). But now, there is no question: his family should take him off the air. And lock him down in the basement for good measure.